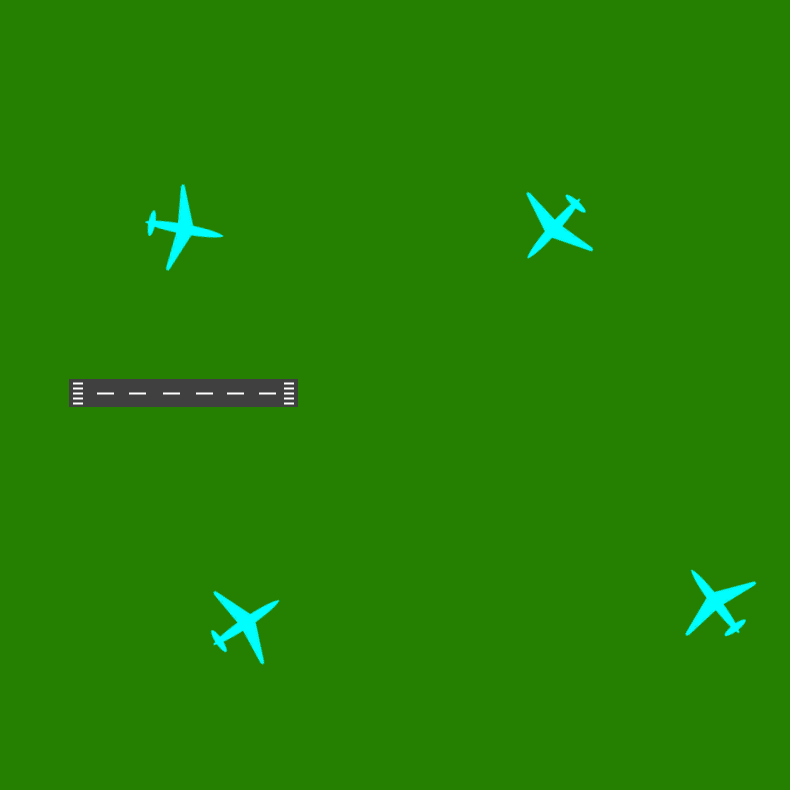 Because the game is pretty abstract, it can be hard for beginners to find out how to land a plane. Here are some basic instructions to get started. 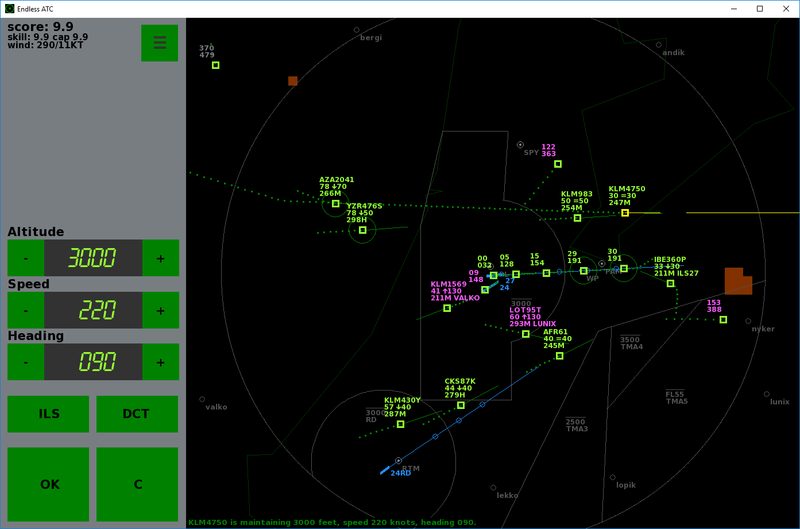 As an approach controller, you guide the planes, coming randomly from different directions, safely towards the runway. 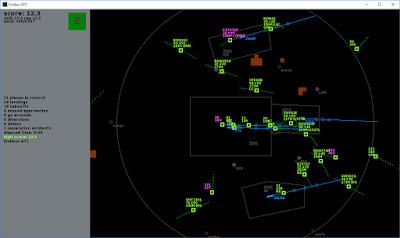 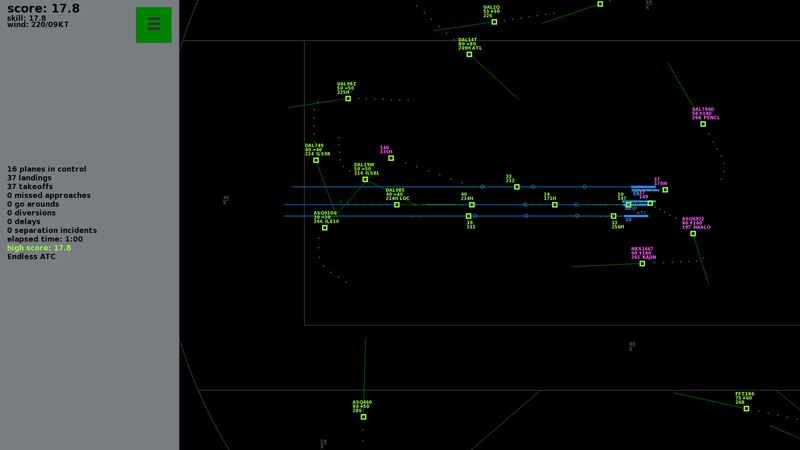 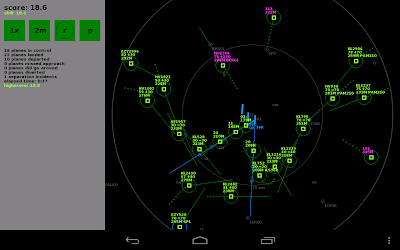 By giving directions (vectors) you position the planes, nicely separated from each other, in front of the runway. 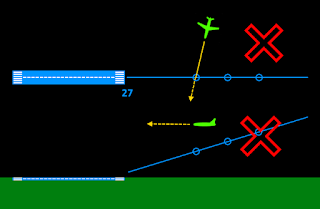 The runway is equipped with a guidance system: the Instrument Landing System (ILS): a straight line at a 3 degree slope towards the runway. 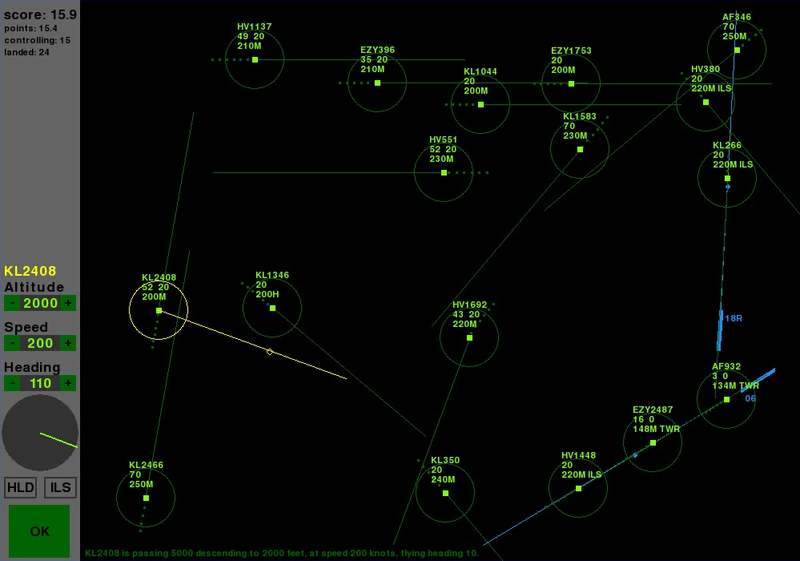 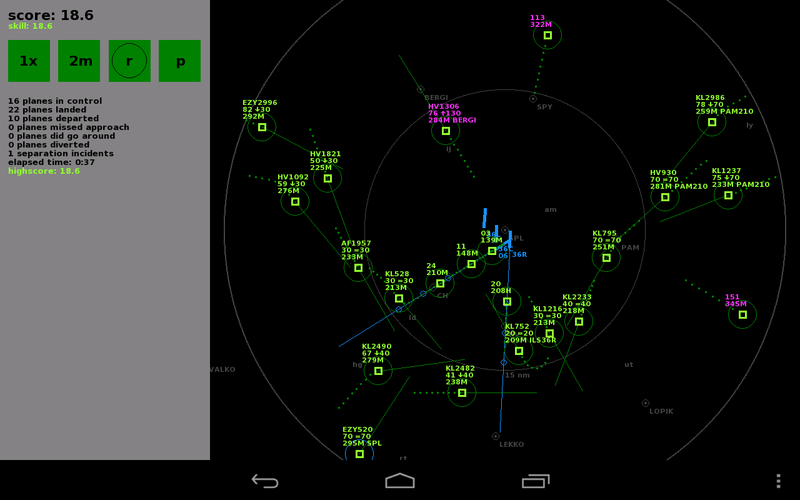 In the simulator it looks like this: a simplified radar screen. The runway has it's own number and a thin line extending from it (the ILS line). 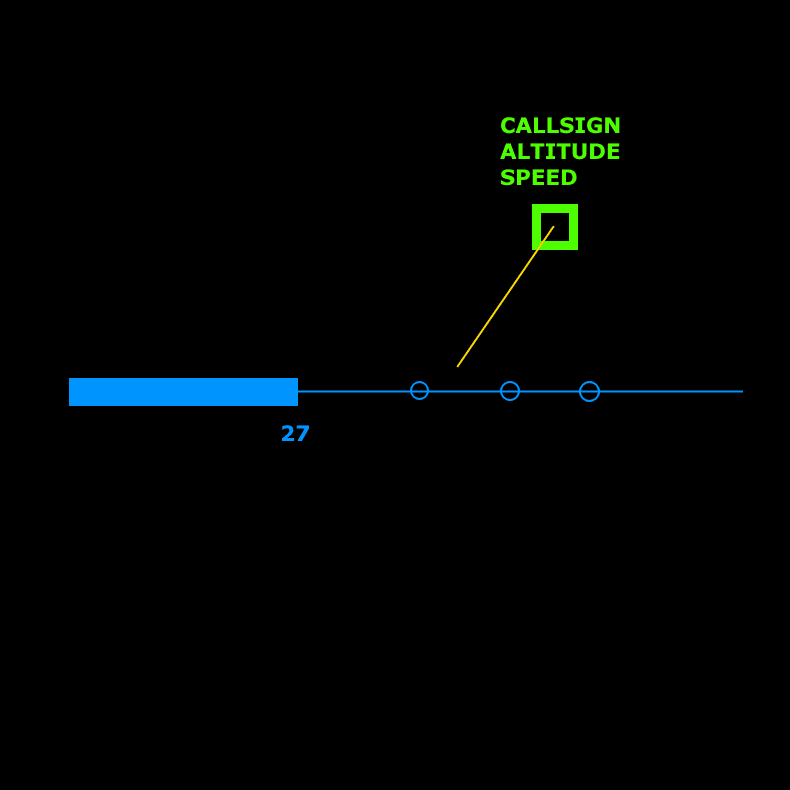 Planes (squares) have a label with their callsign, altitude and speed. 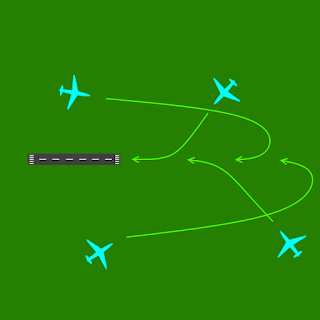 The planes enter your airspace at a pretty high altitude, so you need to let them descend first. In this example you see a plane currently at 7000 feet, but descending towards 2000 feet, while flying at a speed of 276 knots. 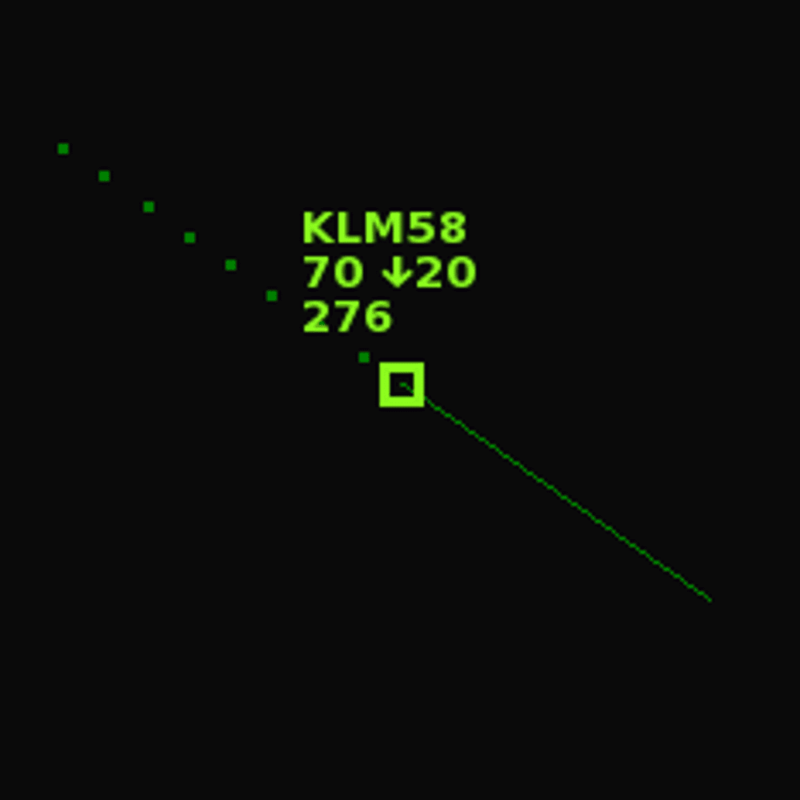 It will take a couple of minutes before the planes reaches its target altitude of 2000 feet. 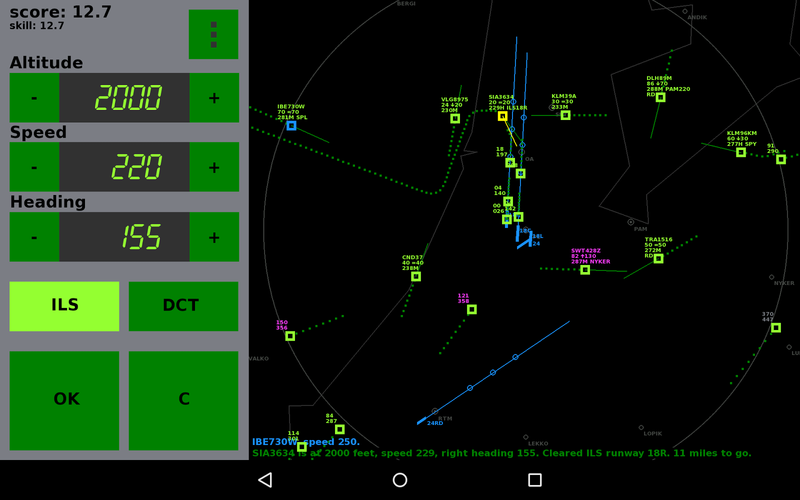 Meanwhile you can give the plane headings towards a point somewhere in front of the runway. 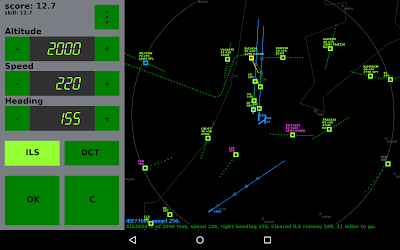 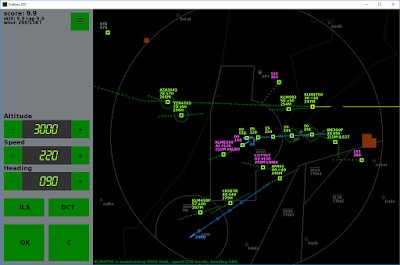 Enable ILS mode to make the plane follow the blue line to the runway automatically. 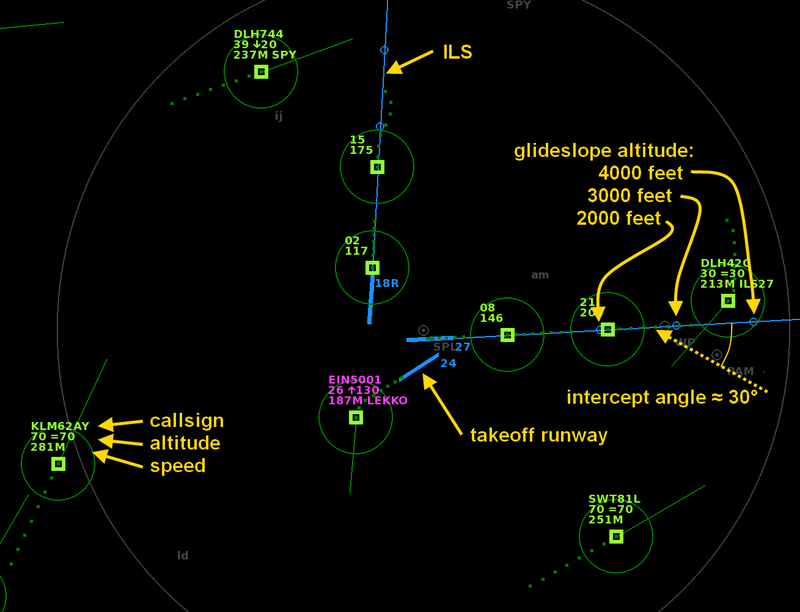 Without enabling ILS mode, the plane cannot land! 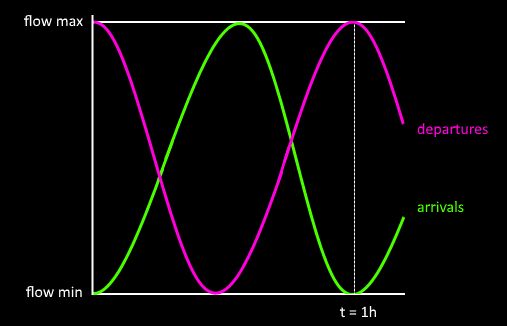 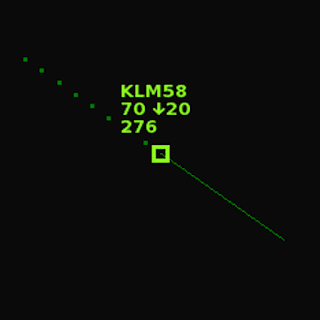 The blue circles indicate the altitude of the glideslope which the plane will need to capture. 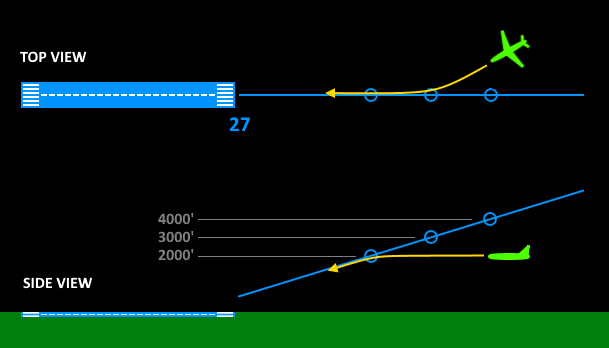 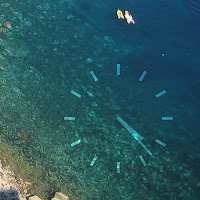 Make sure the plane captures the blue line at a shallow angle, or else it will fly straight ahead. 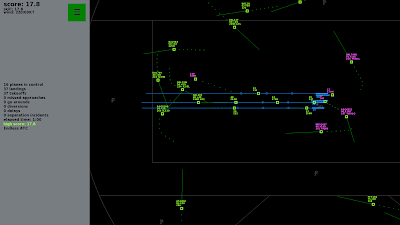 This is just like how it's done in real life. 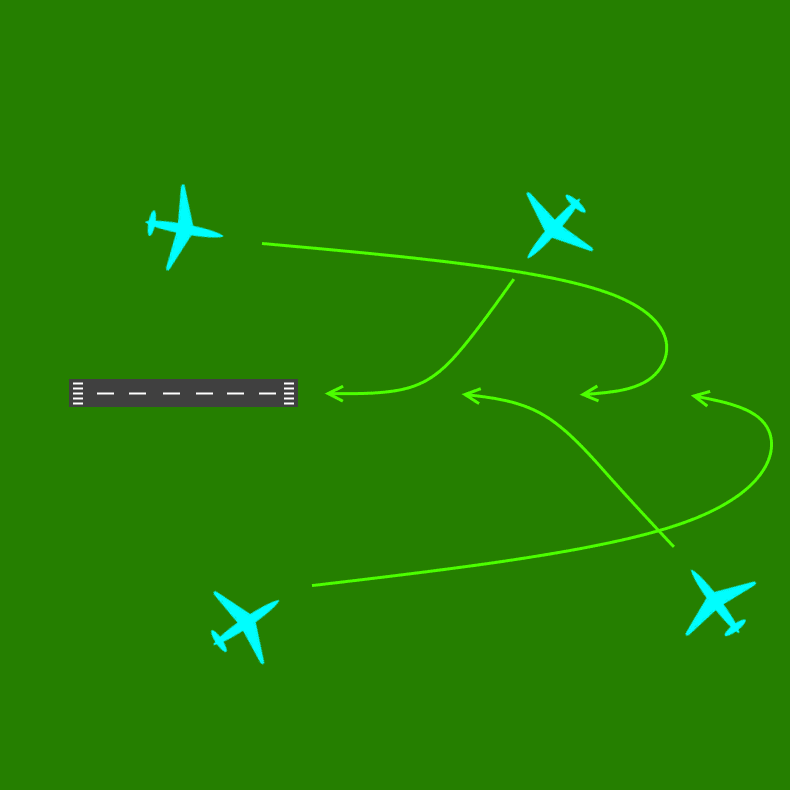 Also make sure that the distance to the runway is big enough, so the plane can pick up the glide path instead of overflying it. This animated gif shows several planes capturing the ILS. 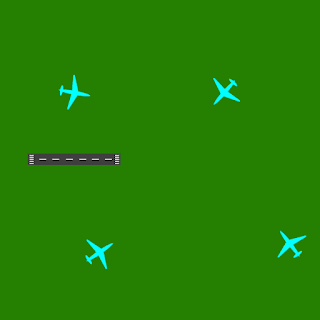 The plane will capture the ILS and land on the runway. 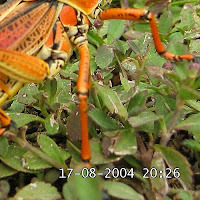 For all details, see the full instructions page.